This entry was posted on Thursday, October 11th, 2012 at 9:54 am	and tagged with Elvis, Elvis art, Elvis Presley, Joe Petruccio, King. 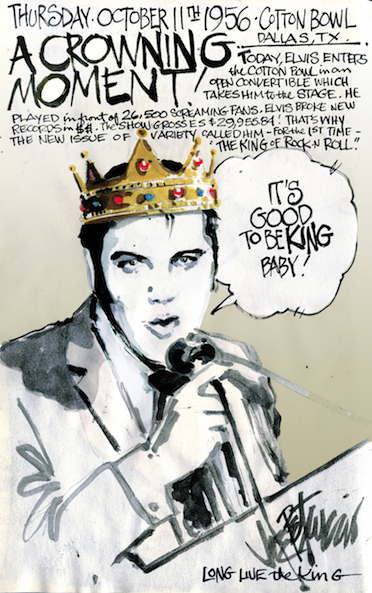 Crown, My Elvis Journal and posted in The King of Rock n Roll. You can follow any responses to this entry through the RSS 2.0 feed. Excellent piece of Elvis history Joe! Thanks for reminding us “oldsters” and letting the new Elvis Fan know how he got that title! Drawing 26,500 fans in 1956……….is truly the feat of a “King”! Joe…..your work is always fit for the “King”! TYVM!